-I am embracing efforts at minimalism, which in this case are satisfied by using one resource (Google Apps) in many different ways. -Keep looks like Post-its. This is pleasing. -Within Keep, quickly click or tap to start and title a note. Notes are displayed in an array before you, and as opportunities arise, you can tap out of one note and into another. This is particularly useful in consultation as student names come up and new info is shared, or when running groups. -Keep allows you to color-code and label notes for organization. Like other Google items, you can share and collaborate a note. Students' work products can be photographed and placed in a note for additional data. You also can make notes contain reminders or checklists. -I have been keeping one note on each student in my charge and I see options ahead- I could either make these a monthly note or each note can be copied to Google Docs. -So far I have been using Keep via its web version on the Mac, but there are apps available for iPad and iPhone and other platforms. -Keep is free with a Google Account and you can log in from anywhere (I got turned off of Evernote when it only allowed you two devices). -Students may also have access to Keep (or you can request the administrator to "turn it on," and it therefore provides another assistive tech possibility within their existing Google Accounts. As I am taking notes in the cloud so to speak, I always only put student initials as identifying info. This video provides a great tutorial from an educational perspective. 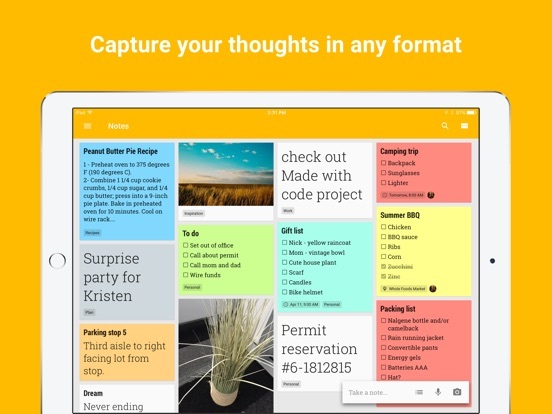 Enjoy Google Keep if you try it!